From the creator of AlphaCity (also found from the Repository) comes exhilarating, architecturally great map with fresh, comfortable mood all the way to the end of the level. 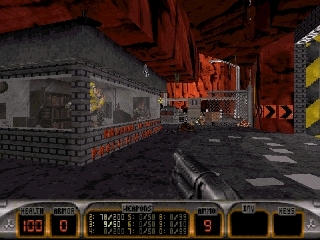 In this map, gameplay location is surprisingly enough, red rocks and your mission is nothing else but blast the way to the nukebutton - alive. While trying to do so, you are going to visit in construction site, destroyed buildings and wide-open outdoor areas that are the one of the best aspects of the level - magnificent look of the level. As already mentioned, the architecture and mood of the level is great and fresh, thanks to the texturework, nice layout and great gameplay balance all the time. The first noticable thing in the level is the brilliant attention to the look of terrain - it seems the author put much effort to the terrain and it shows. 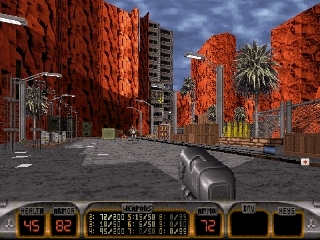 Without the amazing terrain level could have been much less interesting, although gameplay is still one of the main key features of the map. In short, it´s just simply superb. Ammo and health ratio is just right, there´s enough arsenal to wipe out alien bastards out of the way and it also pleases you as it should. 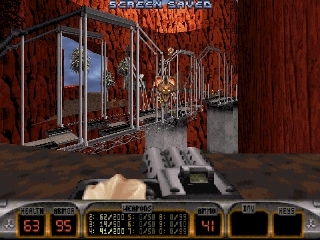 Running through the landscapes and killing aliens is just as satisfying as getting rid of your mother-in-law - you just want to do that again and same thing is with this map. Replay value is quite high and after 15-20 minutes, map lets you begging for more, in good and bad. While texturing and lighting being somewhat simple in the map, it doesn´t feel cheap at all, actually it fits pretty well to the original theme of the level. Spritework also has a huge role affecting to amount of details and gameplay. There is good looking bridge, crane and some machinery to please your eyes and gameplay is spiced up with occasional platforming moments with clever use of spritework. Welcome additions. The only serious problem in the map though is the amount of invisible walls surrounding the gameplay area. Partly it could have easily been fixed, partly not, but it still matters gameplay at times, although fortunately it´s still minor problem and easy to forgive. So, Red Rock is surprisingly successful release that has something for everybody. Whether you are looking for details, great texturing, visually stunning environments or excellent gameplay, all come into one in Red Rock. You may want to play this map more than once, thanks to the high replay value and emotion to get more out of it. Everything you should expect from the Duke map can be found from this map, so what are you waiting for? Go ahead and see yourself. because you will be surprised!